Lust och fägring is one of the hardest routes in Blåberget, and with only three bolts the hardest ”partly bolted” route. This blank face was first climbed by Krister Jonsson in 2005 and for some reason the second ascent was not done until 2011. 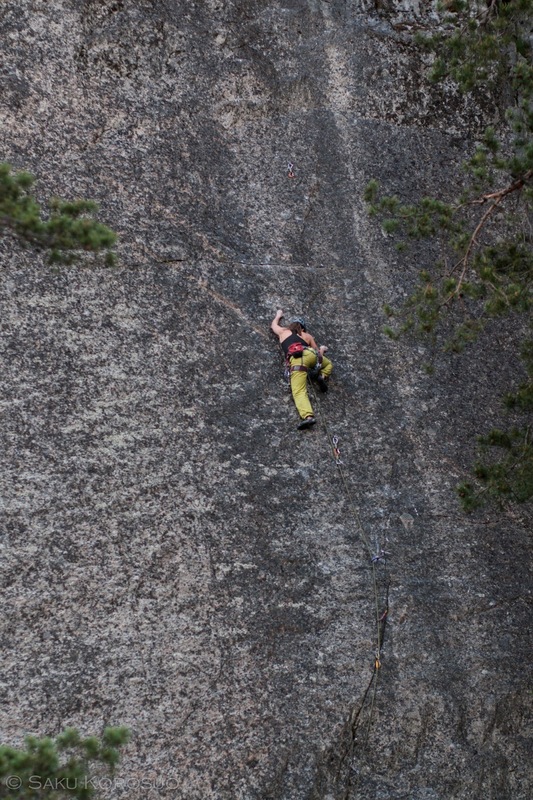 The first repetition was done by Jonas Wiklund, who called the route a sandbag and proposed a grade 7c+. The route was originally graded with a Swedish grade 8 (7b+/7c). Both I and Anu tried the route in Blåbergsträff, and now we drove back for a tick. It’s actually pretty convenient that we can nowadays work on same routes. What comes to the route, it’s very technical, but there are no hard moves. It’s a slab and you can take a no-hand rest in several places. The downside is that as your feet are already burning, the no-hand rest actually just makes it worse. At first the route felt very difficult, but on the other hand we were most of the time just trying to figure out the right sequence. Once we found out how to climb the route (btw, it’s very different route if you are 180 cm or 163 cm) it felt pretty easy. On the other hand even the hardest routes tend to feel easy after several tries. Still, if I compare the route to similar routes, like År av ensamhet (7b) or Kanten (7b+), I think it’s about the same difficulty as Kanten or a bit more difficult. So, for me the original grade does not feel like a sandbag, especially as grading in Blåberget is generally hard, but maybe it’s on the harder side of the scale? 7c? I think this is a bit misleading information. You can put 3 - 4 solid protections before the first bolt (we are a bit pussies so we put 6...), a very good cam to the horizontal crack between the second and last bolt, and a #3 cam 5 meters after the last bolt. So, in total we put 9 pieces of protections and clipped three bolts.